The story opens with the sudden appearance of one of the Shinigami lit. "death god"), a military order who escorts the souls of the dead, named Rukia Kuchiki in teenager Ichigo Kurosaki's bedroom. She is surprised at his ability to see her, but their conversation is interrupted by the appearance of a "hollow", an evil spirit who was originally a human soul. 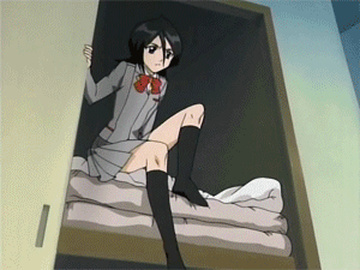 After Rukia is severely wounded while trying to protect Ichigo, she attempts to transfer half of her reiatsu to Ichigo in order to let him face the hollow on equal footing. Ichigo unintentionally absorbs almost all her energy, allowing him to defeat the hollow with ease. The next day Rukia appears in Ichigo's classroom as a seemingly normal human, and informs Ichigo that his absorption of her powers has left her stranded in the human world until she recovers her strength. In the meantime Ichigo shelters Rukia in his home and takes over her job as a Shinigami, battling hollows and guiding lost souls to the afterlife realm known as Soul Society. After a few months of this arrangement, in the sixth volume of the series, Rukia's Shinigami superiors find out about her giving her powers away (which is illegal in Soul Society) and send a detachment to arrest her, and sentence her to death. Ichigo is unable to stop Rukia's capture, but with the help of several of his classmates who also possess spiritual abilities and ex-Shinigami Captain Kisuke Urahara, he sets off for the Shinigami base, located in Soul Society. Once there, Ichigo and company battle against the elites of the Shinigami military, and are ultimately successful in halting Rukia's execution. It is then revealed that Rukia's execution and Ichigo's rescue attempt were both manipulated by Sōsuke Aizen, a high ranking Shinigami previously believed to be murdered, as part of a far-reaching plot to take control of Soul Society. Aizen betrays his fellow Shinigami and allies himself with the strongest hollows, arrancar, becoming the main antagonist of the series, and Ichigo teams up with his former enemies in Soul Society after learning that the next step in Aizen's plan involves the destruction of his hometown. However, Ichigo goes with a few friends to the Hollow's world, Hueco Mundo, in order to rescue their friend Orihime Inoue who was kidnapped by Aizen in order to reduce the number of Shinigami defending Soul Society. At this point, Bleach chronicles the war between Aizen and the Soul Society, a plotline which has not yet been resolved. According to Tite Kubo, the ending of the series is not yet planned out or written.